Our friend Beth brought me a treasure, found on her recent trip to Mexico, this richly-hued inlaid abalone bangle. I'm always touched by travel gifts, from a little ceramic hippo to an art museum postcard; however, Beth's artist's eye makes such gifts especially pleasing. So generous of her to think of me, and tuck this beauty in her bag. Admiring its organic natural palette, I wondered why I wasn't wearing more of this cousin-of-pearl, given its astonishing range of natural, undyed colour. Abalone is not a product of pearl-creating molluscs. 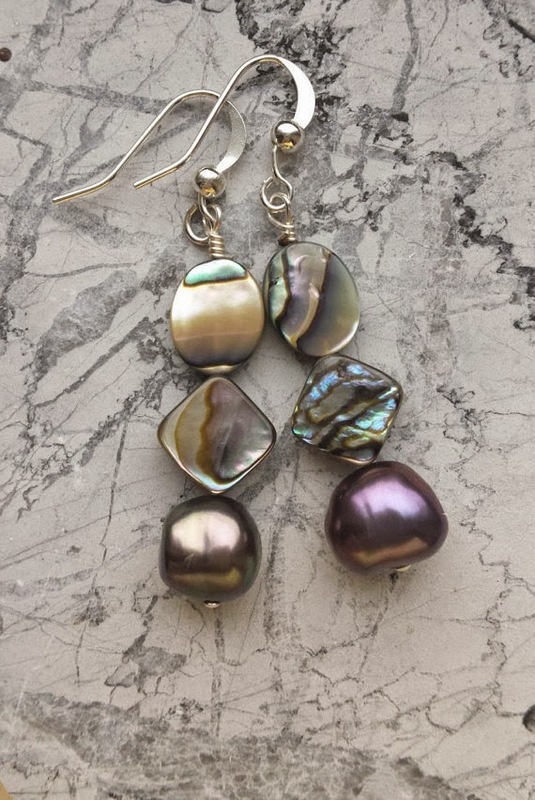 Known in New Zealand and Hawaii as pāua and in the UK as ormer, abalone is the nacreous lining of the shells of gastropods (sea snails), and is primarily found in jewellery made near its native oceans. Today, I'm dressing the Passage's windows with some abalone pieces that flash iridescence and are especially well-designed. Since sea snails that produce such jewelry are native to their waters, Mexican artisans excel at working with abalone, making both simple and more ornate pieces. Etsy seller SaltedGems offer a set of two thin bangles for $6, the price of a few coffees. Can't beat that! 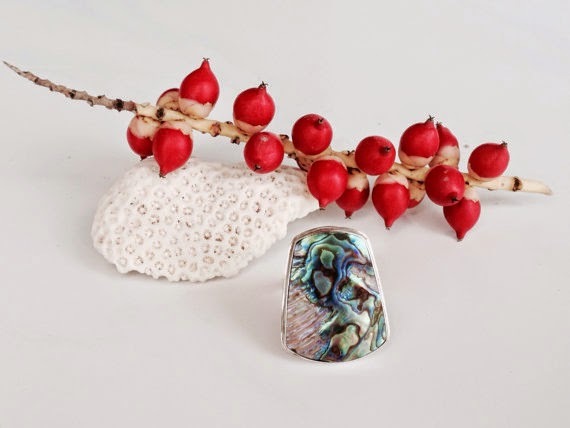 The same seller offers a substantial silver-set abalone ring, with an adjustable silver band, which is especially good for gifts should you not know the ring size. A dramatic piece for the price, $50. 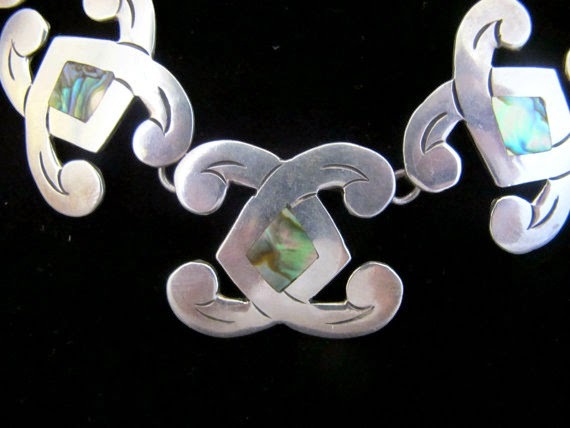 I'd guess this silver and abalone vintage necklace is Mexican (the seller, Gary Germer, does not say). I'd definitely spring for it over the many trendy costume necklaces that are frighteningly close to the same price ($235). Earrings of abalone are light, and the material mixes well with pearls. These dangles, from Luccia, pair freshwaters that complement the abalone's blue and violet flashes. I especially like that the two pearls are complementary but unmatched, a quirky touch. Price, $40. 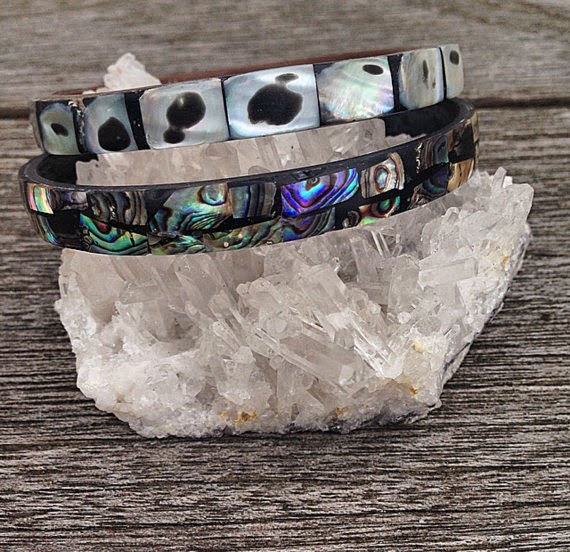 Abalone looks alluring with spring and summer clothes and travels well, wrapped in a jewelry bag or tucked into socks. The glowing hues whisper of the sea and the shifting, sensual palettes suit any complexion. Care is the same as with pearls: keep chemical products away and wipe after wearing with a soft, dry cloth to remove body oils or dirt. Today's window also proves that my motto, After 50, Your Jewelry Should be Real, means you need not empty your bank account for serious stones and heaps of high karat gold. The natural world offers abundant beauty through semi-precious stones, shells, and organic materials such as wood and glass. We do have to search out stellar pieces that show superior design and solid craftsmanship, but that's the joy of the hunt—which in this case, was undertaken by a friend with an expert eye and generous heart. 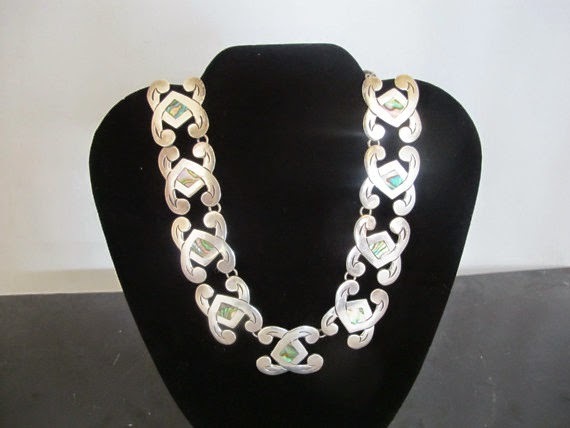 Mexico offers some opportunities to purchase silver and pearl jewellery at reasonable prices. I need to go through my boxes at home because I know that I have some abalone. I've always loved abalone jewelry. Abalones are also native to California, and were harvested almost to extinction mid-century, so now are protected with very strict laws about sizes, numbers and methods of fishing. Back in high school, my favorite piece of jewelry was a baby abalone shell worn as a pendant from a choker. My (then) boyfriend had found it inside a dead and dried out starfish. Oh, how lovely! I'm so glad you like your bracelet, and now you've taught me much more about abalone as well. Une femme, I think we'll have to toss for those earrings - I love them too! I am not apt to wear abalone jewelry, but the shells are wonderful. I remember when we used to find them on the Northern California beaches. My wonderful mother-in-law gave me an abalone cuff bracelet many years ago that she had bought in Florida. After reading your blog, I got it out, polished it up and now can't wait to wear it. Would love to have added a picture of the bracelet to my comment for you to see it. I also love the earrings. So pretty. I don't think I've worn anything with abalone for years, not intentionally though, and will have to reconsider.